Don't let your upper lip get lonely. Get this 'stashe! 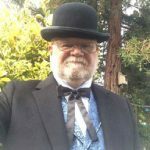 Wore it for the first time in conjunction with a suitable Victorian outfit from Gentleman's Emporium on a visit to Virginia City, Montana. What a hoot. Everyone wanted our photo (but I'm rather certain it was my wife's photo they really wanted). Looked convincing and stayed on just fine all day, even in a breeze. Purchased this for a funny character to wear in a murder mystery performance, so I wasn't concerned about how real it looked. I was very impressed. This is a quality product that easily passes for the real thing. I will have confidence about future purchases. Mustache looks amazing. Exactly as ridiculous mixed with classy as I wanted it to.